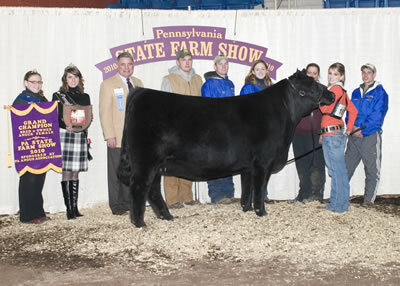 B C A Scaara NetWorth 810 won grand champion female and grand champion bred-and-owned female at the 2010 Pennsylvania Farm Show's Junior Angus Show, January 10 in Harrisburg, Pa. Hannah Grim, East Berlin, Pa., owns the June 2008 daughter of S A V Net Worth 4200. She earlier won intermediate champion. Tom Turner, Columbus, Ohio, evaluated the 59 entries. 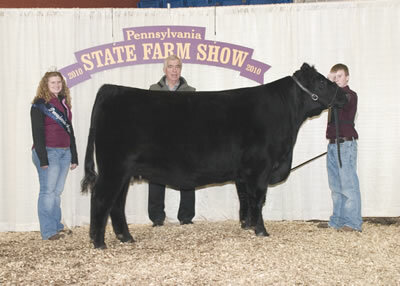 Triple N Dakota 309 won reserve grand champion female and reserve grand bred-and-owned female at the 2010 Pennsylvania Farm Show's Junior Angus Show, January 10 in Harrisburg, Pa. Ryan Nolt, New Holland, Pa., owns the March 2009 daughter of Plainview Lutton E102. She first won junior calf champion. Tom Turner, Columbus, Ohio, evaluated the 59 entries. 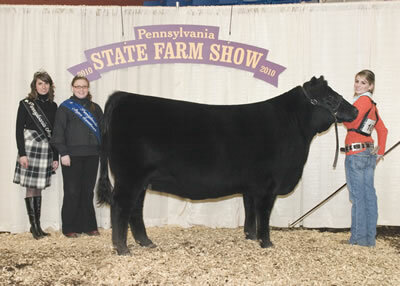 Just Enuff Lutton Carly won senior champion female at the 2010 Pennsylvania Farm Show's Junior Angus Show, January 10 in Harrisburg, Pa. Kyle Livingston, Dover, Pa., owns the winning female. 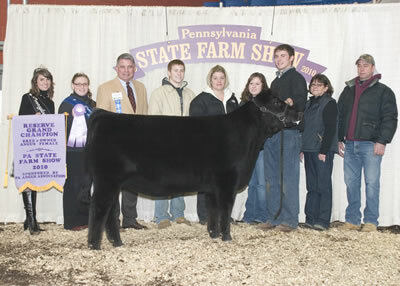 Freys KJF Blackcap N84-T13 won junior champion heifer at the 2010 Pennsylvania Farm Show's Junior Angus Show, January 10 in Harrisburg, Pa. Fred Frey, Quarryville, Pa., owns the winning heifer. 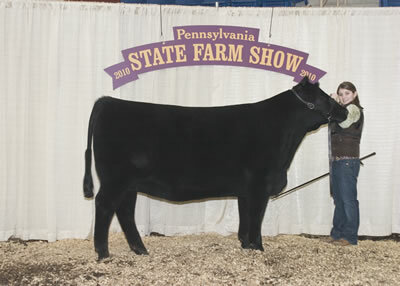 Cedar Hill Dream Girl 238 won reserve junior champion heifer at the 2010 Pennsylvania Farm Show's Junior Angus Show, January 10 in Harrisburg, Pa. Amanda Thompson, Wellsville, Pa., owns the winning heifer. 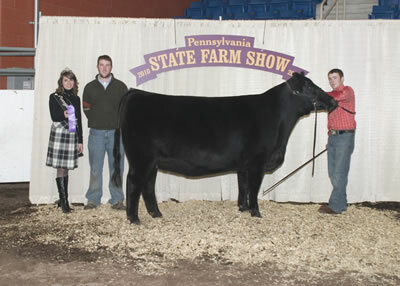 B C A Scaara Paris H89 won reserve intermediate champion heifer at the 2010 Pennsylvania Farm Show's Junior Angus Show, January 10 in Harrisburg, Pa. Hannah Grim, East Berlin, Pa., owns the winning heifer. 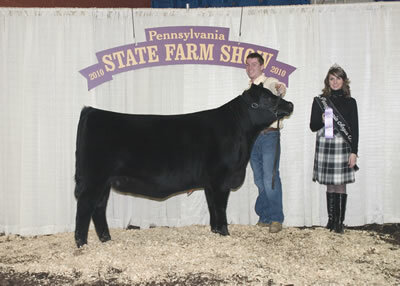 B C A Carrie D85 won senior heifer calf champion at the 2010 Pennsylvania Farm Show's Junior Angus Show, January 10 in Harrisburg, Pa. Bailey Druck, York, Pa., owns the winning heifer. 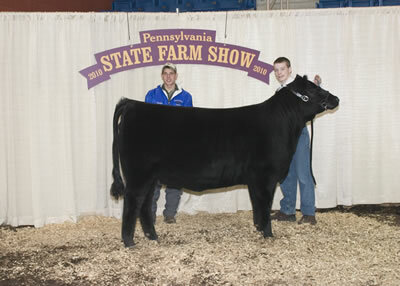 C M Blackcap 9018 won reserve junior heifer calf champion at the 2010 Pennsylvania Farm Show's Junior Angus Show, January 10 in Harrisburg, Pa. Cody McKean, Mercer, Pa., owns the winning heifer. Photos courtesy of David Mullins, American Angus Association.